This is a novel from 1954 about Clarence, a white man who, finding himself broke and stranded in Africa, decides to approach the king and ask him for some sort of job. Clarence’s only qualification is that he is white — which admittedly was no small thing in colonial Africa — and after he fails to contact the king, he is taken under the wing of a beggar and two boys, and begins a journey south, hoping to meet the king again later when he visits that part of the country. It’s a dreamlike, sensual narrative; I’ve noticed before that novels from Francophone Africa (Guinea, in this case) seem to be more stylised than those from former British colonies. It echoes and subverts the tradition of white men’s adventures into darkest Africa. Africa seen through Clarence’s eyes is a world of fetid scents, impenetrable jungle, and the buttocks and breasts of the women; but he is completely ineffectual and naive, dependent on and manipulated by those around him. My first impressions of this were really good; I enjoyed it for the characterisation and description, atmosphere, nuance. For me it didn’t sustain that level of excitement though to the end, but it was still a very good read. 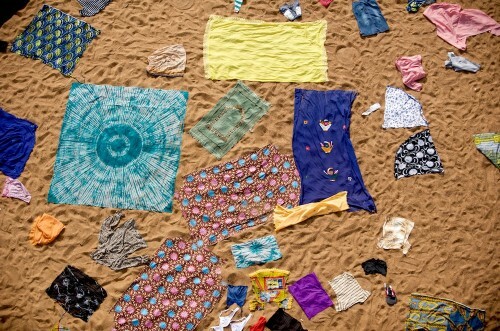 » The photo, ‘Washday on the Niger’ is © Julien Harneis and used under a CC by-sa licence.